Potential case study topics: Fine Arts, Landscape Architecture, Media Studies, Political Science, Forest Policy, Medicine, Kinesiology, Biology. Take the Ethnobotany Plant Tour of the UBC Campus. Use your smartphone (with Wi-Fi) to take the tour. Many of the stops on the tour feature Campus Botanica signage and embedded in each stop on the Google Map tour is a link to the Indigenous Research Partnerships plant database. After completing the plant tour of campus, return to the pathway(s) and answer the questions. What people/culture is being interpreted? What was their relationship to this place/this site/this area? What processes and outcomes are interpreted? 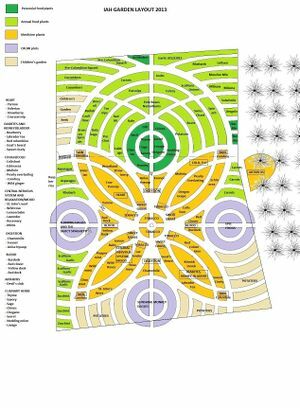 Layout of the Aboriginal Health Research and Education Garden, including the plants from 2013 and their health benefits. By UBC Farm. CC BY-SA 3.0. Why are plants hidden in plain sight? What are the implications of losing awareness of the presence and diverse uses of plants in our everyday lives? How are plants with ethnobotanical purposes suited to the campus landscape? Do they seem out of place? Evaluate the interpretive signage you visited on the Ethnobotanical tour. Did the information help you gain a deeper understanding? Why or why not? What kind of signage or resources creates a more meaningful learning experience? The discipline of ethnobotany has emerged as an important interlocutor in federal and provincial policy decision around Indigenous Peoples’ land rights and titles in Canada. In June 2014, the Supreme Court of Canada granted the Tsilhqot’in Nation the full Aboriginal title for the grounds their people inhabited exclusively at the time when representatives of the British Crown staked claims 250 years ago . How did the Tsilhqot’in prove the extent of their land rights? Partly through ethnobotanical investigation. During the trial, distinguished ethnobotanist Nancy Turner offered her opinion that the Tsilhqot’in people have been present in the Claim Area for at least 250 years based on the length of time required to develop the names and knowledge of the Claim Area plants used for food and medicine . The study of how ethnobotany can be applied to policy development, planning, and decision-making is at the forefront of Dr. Nancy Turner’s emerging research. Demonstrating people’s dependence on plants for their well-being and their absolute need for ecosystem integrity in their territories can be a compelling approach to contest intrusions from the Crown . Research around traditional management of plants and landscapes is now, more than ever, a priority to ensure that Indigenous people in British Columbia are recognized as cultivators of the land and they can maintain or gain the right to their land under the Canadian government land claim criteria. What role do young people play in the future of ethnobotany? Are they equipped to incorporate traditional plant uses into decision-making? How can we raise the profile of traditional plant uses to achieve a higher and more influential profile to inform provincial and federal policy? What role could the university play in achieving this? What are key components in the code of ethics before research is undertaken relating to cultural knowledge and practices in ethnobotany? What are the barriers to referencing ethnobotanical uses in the court of law? How might other challenges involving environmentally damaging activities in the face of climate change benefit from the study of ethnobotany? Ethnobotanical and ethno-medicinal knowledge has been preserved through the ages in written or oral form. While some of this traditional knowledge (e.g., for herbal medicine) has been incorporated into Western medicine  and research of plant resources in traditional medicine has intensified with the aim of finding new cures for different health conditions , chemically synthesized drugs, in many parts of the world, have been prioritized as the main way to revolutionize health care. Throughout history, Indigenous peoples were coerced into abandoning their cultural beliefs and practices in relation to health care through the process of colonization. Their loss of control over the land base and its resources contributed to the systematic destruction of Indigenous knowledge and cultural systems  Only recently has the scientific establishment recognized that traditional healers were highly gifted persons, subject to years of exhaustive training, and whose understanding of nature and the workings of the human body-mind complex surpassed that of western science . Today, the challenge lies in sharing traditional medicinal knowledge across cultures. Posey and Dutfield (1996)  argue that the ethnobotanical literature (journal articles, databases, and field collections in particular) serves as a major source of information and ideas for researchers and industries with commercial objectives. End users of this information are often third parties who have had no direct contact with the Indigenous communities whose knowledge they are appropriating (Barnett and Banister, 2000). To counterbalance this tendency, medical professional and Indigenous healers need to create a space for dialogue and knowledge sharing. At UBC, the Indigenous Research Partnerships aims to further develop research and education on areas of shared priorities between the Indigenous community and the university. The support of knowledge synthesis, translation and exchange from an Indigenous lens can help to stimulate innovating research in the field of medicine. Which of the plants on the tour have contributed to western pharmaceutical products? How? What are the costs and benefits of allowing knowledge of plants and their functional biomedical components to fall under intellectual property rights? What alternative models or examples exist that acknowledge and properly attribute traditional knowledge in the development of new medicinal products? ↑ 1.01.1 Jones SB., Hoversten ME. (2004). Attributes of a Successful Ethnobotanical Garden. Landscape Jrnl. 23(2): 153-169. ↑ Fakim A. (2006) Medicinal plants: Traditions of yesterday and drugs of tomorrow. Molecular Aspects of Medicine. 27(1): 1-93. ↑ Wachtel-Galor S., Benzie I. (2011) Herbal Medicine: An Introduction to Its History, Usage, Regulation, Current Trends, and Research Needs. In: Benzie IFF, Wachtel-Galor S, editors. Herbal Medicine: Biomolecular and Clinical Aspects. 2nd edition. Boca Raton (FL): CRC Press/Taylor & Francis; 2011. Chapter 1. ↑ 6.06.1 Obomsawin R. (2007) Traditional Medicine for Canada's First People. ↑ Posey, DA., Dutfield G. (2014) Beyond Intellectual Property : Toward Traditional Resource Rights for Indigenous Peoples and Local Communities, International Development Research Centre. ProQuest Ebook Central.